RARE BEAUTIFUL NEW ORIGINAL MIXED MEDIA PAINTING "Flamenco In Orange"
..........BY THE INCREDIBLE ARTIST SERA KNIGHT......... Sera Knight She has exhibited in London (with S.W.A and R.I at the Mall Galleries and was part of joint exhibitions at the Gallery of St Martin in the Fields, Turkish Embassy and Abney Hall in Stoke Newington). She regularly exhibits in Norway and in Turkey and has had one-man exhibitions in both countries. "These are superb Sera Knight paintings. Sera's work is in many private collections in the U.K, Europe, U.S.A and Australia!!! Sera's paintings of dancers have been made into a fundraising calendar for 2009 in USA. 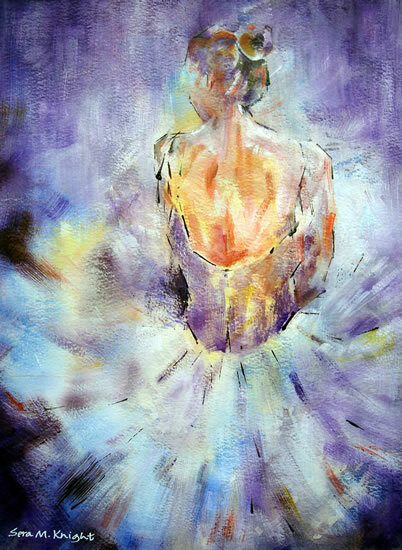 In addition, some of her paintings of dancers have been used by design firms in USA. As a result she was approached by a gallery in Beverly Hills to take part in an International competition!!! "An Amazing Blue Chip Investment Opportunity to Acquire an Original Sera Knight Painting" ..
Sera has been drawing and painting since childhood. She paints mainly in watercolour, acrylic and mixed media. Tackling human figure and perspective has always been her favourite subjects but she also enjoys different subjects where drawing creates a challenge. Regardless of the subject, to be able to use the light cleverly, create a mystical atmosphere together with technical and emotional strength is her aim. Sera also paints on glass objects to the effect of stained glass and exhibits these separately. Born, in Ankara, Turkey, Sera has a degree in Architecture. She lived in Stavanger, Norway from 1980 to 1993 and worked as an architect in the oil industry. She moved back to UK when her husband’s job was repatriated and studied with Liz Seward Relfe until Liz retired from teaching. She lives in Woking, Surrey and is a member of various art societies and exhibits her work regularly with these. She has exhibited in London (with SWA and RI at the Mall Galleries and was part of joint exhibitions at the Gallery of St Martin in the Fields, Turkish Embassy and Abney Hall in Stoke Newington). She regularly exhibits in Norway and in Turkey and has had one-man exhibitions in both countries. Her work is in private collections in UK, Europe, USA and Australia. Her paintings of dancers have been made into a fundraising calendar for 2009 in USA. In addition, some of her paintings of dancers have been used by design firms in USA. As a result she was approached by a gallery in Beverly Hills to take part in an International competition. Sera is also popular among GSCE and A level students and has been chosen as the artist to be studied for their course work many times. Sera teaches adult education classes and tutors private groups and holds workshops and gives demos in watercolour, acrylic, mixed media and drawing mediums.